A business is either sustainable or it isn’t. For a business to survive it needs to get to sustainability. Meaning it needs to make a profit, or easily be able to make a profit by cutting expenses or investments. Most startups are not sustainable, and in my opinion that’s why everyone at them is so stressed, because they can sense impending death. Paradoxically, the higher the stress the higher the chance of death. It’s like you're staying at a cabin in the woods for the weekend during the dead of winter. One morning you decide to go for a nice stroll through the woods to the town just 2 miles away down the path. It’s sunny out so you set off in just your sweater, bringing a little water for the trip. You’re excited to get to town and sit down for a nice warm dinner at the pub. You’ll Uber back later. At first things go well. The path is well marked and the sunshine and fresh air are exhilarating. You’re enjoying the trip. A little ways in, you realize you’ve made a wrong turn, and you lose the main path. You get a tiny bit worried, but quickly retrace your steps, certain you’ll find the path again. And you do. Thank goodness. You realize you really should have brought a map. But no worry. The path seems well enough marked. For a minute, you stop and consider going back but the hunger in your belly and confidence in yourself propels you forward. You continue on. After a little bit you notice you have taken a wrong turn again. The path you are on ends abruptly at some dead trees. Again you retrace your steps, sure you’ll find the main path again. But this time, you don’t. You come to another dead end. Getting a little worried, but still confident. You search around for 10 minutes for the main path, but it is nowhere to be found. Now your heart starts pumping a little harder and you break a sweat. You sit and think. This doesn’t make any sense. You know the path must be around here somewhere. You start kicking yourself for not bringing a jacket. As you sit and think you slowly realize that if you don’t find the path before sun sets, you could die out here. You walk around in circles again trying to find the path, but you don’t. A deeper fear sets in. You realize that even if you had a map and a jacket, it’s stupid to be out here without a compass! An hour goes by. You are consumed with self-hatred as you walk and search and stop and think and admonish yourself. You begin to become consumed by the fact that there is a very real possibility that you could die out here once the sun sets, and it has begun to set already. Panic sets in. In your panic you forget that the sky can help you orient yourself between town and your cabin. Eventually as the light fades, and the temperature begins to plummet, you randomly pick a direction and run in that direction through the woods, expending all your remaining effort in a blind last ditch effort to survive. Maybe you make it. Chances are you don’t. This is the story of most startups. We start with the best intentions and a sunny mood, and we die in the woods after a series of bad decisions. We never get to sustainability. Bring a map - ie. have a plan for where you want to get to. This could be $X/month in revenue, or X number of customers. Know your sustainability milestone and put it on the wall. This is where you are headed. Whenever you feel lost, look at the map. Too many companies proceed without a map. It’s crazy to start a journey unless you know exactly where you want to arrive. Bring a compass - ie. track your metrics. Pick 1 - 3 key metrics and focus on them relentlessly. They tell you where you are on the map. The path for startups is mostly un-tread and so it’s easy to lose. Your metrics will tell you which direction to go even when there is no path. Listen and respond to the environment - ie. take a minute and feel into what’s happening. What are the market and your customers telling you. What is your team telling you? What are your advisors telling you? What is your heart telling you? it’s likely they are highlighting dead-ends and pointing you towards sustainability. Bring a jacket - ie. resilience, independence and a positive attitude. Realize that you aren’t your startup, that most entrepreneurs fail a few times before they succeed, and that this whole entrepreneur thing is supposed to be fun. If you find yourself miserable or panicking, take some time away from the business and recalibrate. Sometimes you have to huddle up in your jacket and wait until the warm light of morning to see the path ahead. 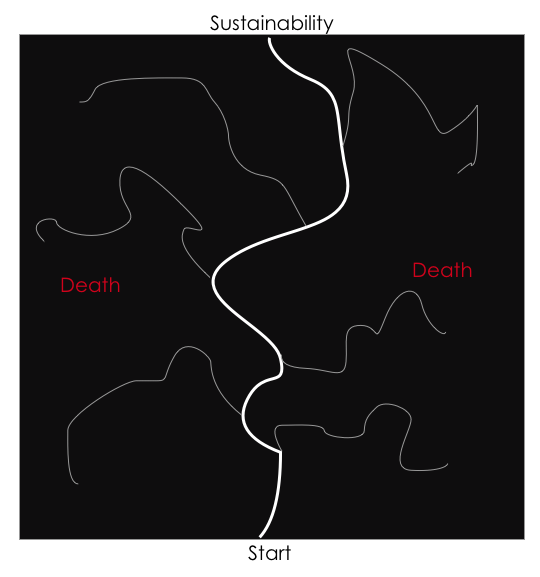 To repeat myself: the path to sustainability leads through dark and treacherous woods. The danger lies not only in the fact that the path is not well tread, but also in the fact that once fear sets in, bad decisions multiply. To avoid the fate described above it’s important to have a map, a compass, a jacket and the ability to tune into your surroundings. In a startup this is a clearly articulated map to get to sustainability, clearly articulated metrics that you will track to get there, an ability to clear your head when things aren’t working, and an ability to respond to what customers and others are telling you. With these four things in place your chances of getting through the woods and arriving at a point of sustainability are much higher. One more thing: if you really really don’t want to die in the woods there’s one more thing I’d recommend, and that’s bringing a guide with you who’s walked the path before. The right coach, advisor or mentor can help you avoid all of the most dangerous wrong turns and expensive cul-de-sacs and get you where you want to go to fastest. I wish I had hired a coach earlier in my startup journey. It would have saved me and my investors literally millions of dollars. Getting to sustainability feels great. It is an achievement. It means you have created a sustainable value-creation-machine that is helping people in the world while also supporting you and your family. You have created the future, and are now the master of your domain. Congrats, you made it. P.S. I love helping entrepreneurs get through the valley of death. If you have a dream that you’d like to make real and you feel some connection with my approach, consider applying for a free session with me.